The National Association of Realtors' May existing-home sales report boasts the highest pace of existing-home sales growth since February 2007 (5.79 million). 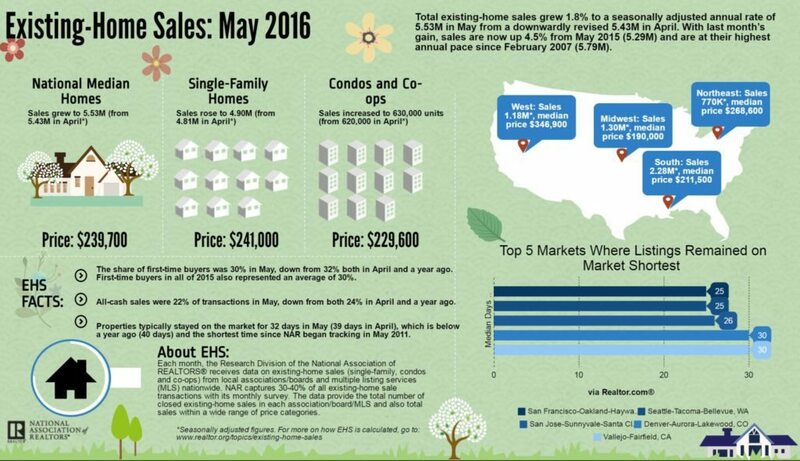 This month's sales grew 1.8 percent to a seasonally adjusted rate of 5.53 million. Inventory woes have yet to go away. Total housing inventory rose 1.4 percent to 2.15 million existing homes available for sale, but is still 5.7 percent lower than May 2015's numbers. Homes are flying off the market in May, with 49 percent of homes staying on the market 30 days or less. The National Association of Realtors’ May existing-home sales report boasts the highest pace of existing-home sales growth since February 2007 (5.79 million). Existing-home sales, which are completed transactions that include single-family homes, townhomes, condominiums and co-ops, grew 1.8 percent to a seasonally adjusted annual rate of 5.53 million from a downwardly revised 5.43 million in April. This is the third consecutive month of increasing existing-home sales. “This spring’s sustained period of ultra-low mortgage rates has certainly been a worthy incentive to buy a home, but the primary driver in the increase in sales is more homeowners realizing the equity they’ve accumulated in recent years and finally deciding to trade-up or downsize,” said NAR Chief Economist Lawrence Yun in a press release. Although existing-home sales are at an all-time high, low inventory woes still have yet to dissipate. Total housing inventory rose 1.4 percent to 2.15 million existing homes available for sale, but is still 5.7 percent lower than May 2015’s numbers. Unsold inventory is at a 4.7-month supply — unchanged from April.
.@NAR: Low inventory woes are still around. Total housing inventory rose 1.4% to 2.25M. “Existing inventory remains subdued throughout much of the country and continues to lag even last year’s deficient amount,” says Yun.
.@NAR: Homes are flying off the market. 49% of homes stayed on the market 30 days or less. Despite rising property prices, homes are moving off the market at the highest rate since 2011. The average property stayed on the market for a mere 32 days in May — seven days less than seen in April, and eight days less than seen in May 2015. Furthermore, 49 percent of homes sold in May stayed on the market less than 30 days — the shortest amount of time since NAR began tracking these rates in 2011. The San Francisco-Oakland-Hayward, California; Seattle-Tacoma-Bellevue, Washington; San Jose-Sunnyvale-Santa Clara, California; Denver-Aurora-Lakewood, Colorado; and Vallejo-Fairfield, California markets had the fastest moving markets at 25, 26 and 30 days, respectively.